This 400 Days malarkey may explain all those Vine hints. If you've been paying attention to The Walking Dead, Telltale's zombie apocalypse game based on Robert Kirkman's story of the same name, then you know there's been some Vine hints dropped concerning new characters. There have been four so far - Vince, Bonnie, Russell and Shel - technically a fifth, if you count whoever it is putting up all those signs. Now a DLC listing, 400 Days, has popped up on the Steam apps database, which may link in to all these Vine reveals. If so, it seems likely that the Vine reveals and DLC drop refers to that same hint dropped by story consultant Gary Whitta lo these many days past, that there would be an interim DLC release between Seasons One and Two of Telltale's episodic survival horror title. This "little something extra," Whitta said at the time, would "make the wait for season two slightly less agonizing." We don't really know much about this beyond the 400 Days title and when it popped up in the Steam history. No doubt E3 will fill in some of those details. Meanwhile, you'll just have to be patient. So good luck to Vince, Bonnie, Russell and Shel; they'll probably need it. 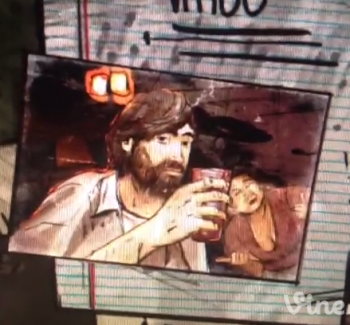 Does the Day 2 listed in the Vine hint mean Vince is the first to go? Place your bets!